A shipbroker is a kind of enormous shopkeeper for ships, and by far the most important item he supplies to them is the fuel on which the ship’s engines run. In those days fuel meant only one thing. It meant coal. There were no oil-burning motorships on the high seas at that time. All ships were steamships and these old steamers would take on hundreds and often thousands of tons of coal in one go. To the shipbrokers, coal was black gold. My father and his new-found friend, Mr Aadnesen, understood all this very well. It made sense they told each other, to set up their shipbroking business in one of the great coaling ports of Europe. Which was it to be? The greatest coaling port in the world at that time was Cardiff, in South Wales. So off to Cardiff they went, these ambitious young men, carrying with them little or no luggage. 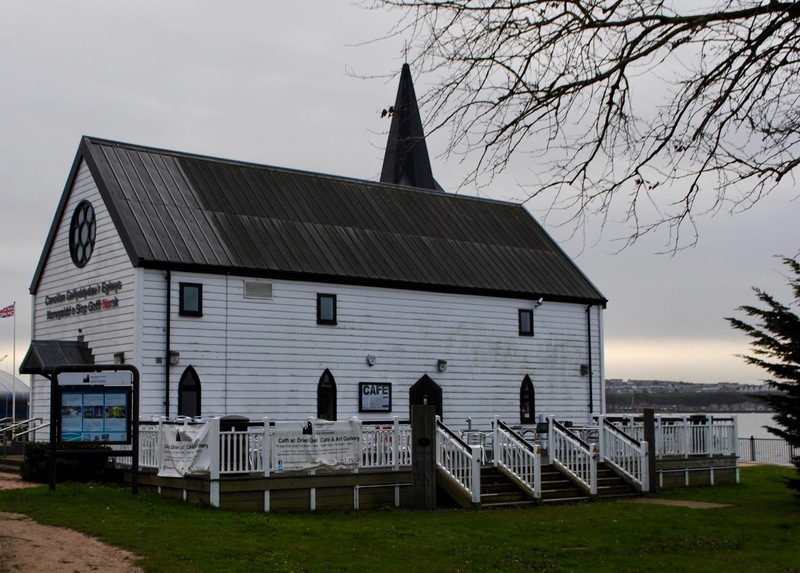 A small wooden church on Cardiff Bay testifies to the most significant influx of Norwegians to Britain since the Viking invasions a thousand years earlier. These nineteenth-century Norwegians were more peaceable than their Viking ancestors, interested in trade rather than pillage. And unlike those earlier visitors they worshipped Christ, not Odin. Almost all of those that came to Cardiff were humble seamen rather than ambitious entrepreneurs like Roald Dahl’s father. The ships from Norway brought strong, straight timber to be used for pit props in the South Wales coalfields and filled their holds with coal to take back to Scandinavia. The Norwegian church, founded by the Norwegian Seamen’s Mission, was built in 1868 on a site provided by the Marquis of Bute (see my earlier post on Tiger Bay) between the East and West Docks. The original building comprised a simple timber frame clad with corrugated iron, with all the materials brought from Norway. The wooden cladding, bell tower and reading room were added later in the nineteenth century. As well as a place of worship, the church soon became a community centre for settled and transient Norwegians in Wales, with the reading room carrying a stock of books and newspapers from the old country. Looking at the size of the place it’s hard to believe that by 1915 more than 70,000 seamen were visiting each year. Harald Dahl the shipbroker was a senior member of the Welsh Norwegian community and all his children were christened in the little church in the docks, even though by the time that Roald was born in 1916 the family lived in a grand house outside Cardiff. With the second half of the twentieth century came the long slow decline of the coal industry. There were fewer ships from Norway and the Norwegians who had settled in Cardiff began to disperse. The church’s congregation dwindled, and in the 1960s the Norwegian Seamen’s Mission ceased its financial and pastoral support. The locals kept the church going for another decade but in 1974 it closed. The building was neglected and suffered further damage from vandalism. And then the Norwegian Church Preservation Trust was established to save the church, with Roald Dahl as its first president. In 1987 the building was dismantled and put into storage (sadly only one its stained glass windows had survived). In 1992 it was re-erected on a new site, a small part of the huge redevelopment programme that was transforming the derelict docks. By 2011 it had been fully renovated and reborn as the Norwegian Church Arts Centre. And now every 17th May, the Welsh Norwegian Society marks Norway’s Constitution Day with a parade to the old church. Everything changes. The docks that were among the biggest in the world are no more; King Coal has been deposed; and though Christianity vanquished the old gods of Scandinavia it has itself been displaced from the Norwegian church by the secular religion of the arts.